↑ Sharma, U. P. (1996). 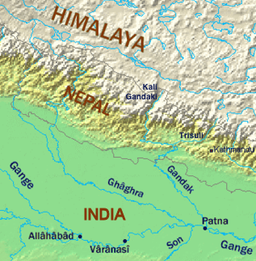 Ecology of the Koshi river in Nepal-India (north Bihar): a typical river ecosystem. In: Jha, P. K., Ghimire, G. P. S., Karmacharya, S. B., Baral, S. R., Lacoul, P. (eds.) Environment and biodiversity in the context of South Asia. Proceedings of the Regional Conference on Environment and Biodiversity, March 7–9, 1994, Kathmandu. Ecological Society, Kathmandu. Pp 92–99. ↑ Nayak, J. (1996). Sediment management of the Kosi River basin in Nepal. In: Walling, D. E. and B. W. Webb (eds.) Erosion and Sediment Yield: Global and Regional Perspectives. Proceedings of the Exeter Symposium July 1996. IAHS Publishing no. 236. Pp. 583–586.